le Qigong est une philosophie et une pratique d’alignement avec le souffle, entretenant la santé physique et psychique, la vitalité, par une pratique de mouvements corporels et respiratoires favorisant la circulation du ”Qi” (énergie vitale) et visant à l’épanouissement de l’être. These Qigong classes introduce excellent sets of contemplative breathing and movement exercises from the Shengzhen Qigong tradition. Through regular practice you will learn to cultivate a strong, supple body, deep relaxed breath and general health of body, mind and spirit. The movements are gentle, yet profound in their affect. The meaning of Shenzhen is ‘Unconditional love’ and Gong means ‘to work or cultivate through practice.’ Thus, this form of Qigong places particular emphasis on strengthening our connection to our heart and our innate capacity to experience, generate and share the quality of unconditional love. Sheng Zhen signifie “Amour inconditionnel”; ce Qigong comporte une composante poétique et spirituelle, une philosophie qui cultive l”éveil” et une compréhension de la vérité sacrée d’amour inconditionnel. Ce Qigong renforce et détend le corps, amène plus de fluidité, équilibre et élève l’esprit. 1 Prendre soin de sa santé en stimulant la circulation de l’énergie vitale (le Qi). La circulation sanguine s’améliore, le mental s’apaise et le corps se détend. 3 Trouver l’enthousiasme de s’imaginer tous ensemble sur cette terre avec un regard nouveau, en vivant à travers le corps la force du Qi et de la bienveillance. We often start with some simple awareness exercises and physical warmups and then move into a “form,” which is a sequence of movements and still postures. In most forms we perform each movement multiple times allowing students to awaken to subtleties, refine the movement and find a clear coordination with the breath. It is both simple and profound in is depth. It can be practiced outdoors and is a great way to cultivate a re-conection with the earth, sun, air and life of the world. It releases physical and emotional stress and leaves one feeling balanced, calm, awake and energetic. Through it we can cultivate love and kindness for ourselves and others through intentions, visualizations and actions integral to the practice. It helps maintain and cultivate health holistically on a physical, psychological and spiritual level. It helps me feel connected to the whole web of life. Medical Qigong forms are based in ancient Chinese understandings of how to cultivate health and longevity through mind-body practices. These forms often focus on the healthy function of the internal organs understood through theory of Traditional Chinese Medicine. Medical Qigong constitutes a fundamental branch of Traditional Chinese Medicine (the others are acupuncture, massage, and herbology). 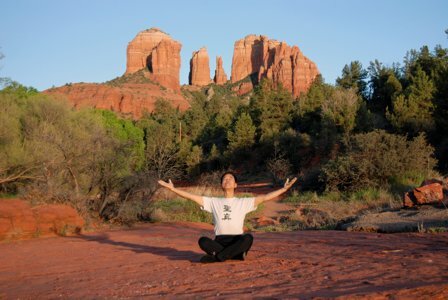 Taiji Chuan (also spelled t’ai chi chuan) is the best know Qigong practice throughout the world. This and other martial forms of Qigong are primarily used to cultivate health and wellbeing. Aligning with their martial roots they place a particular emphasis on developing grounding, power and ease, which prepares a person to gracefully engage with all they encounter in this world. A history of my personal path of Qigong practice. I began my studies of Qigong in 1997, with Yang style Taiji Chuan the slow, meditative, marital movements that are the most well known form of Qigong in the world. This initial exposure included numerous preparatory and training exercises that I was particularly attracted to and would practice daily. I went on to study Chen style Taiji Chuan while living in China for a year in 1999-2000. I continued with these forms of Taiji based practice for many years until I began studying medically oriented qigong while living in France in 2005-2006. I continued learning more medical and health oriented forms while studying Shiatsu and Massage Therapy in California from 2006-2008. It was during this period that I was exposed to Sheng Zhen Qigong, a form that I would describe as more heart centered then what I had encountered before. Shen Zhen means unconditional love, and as a Qigong system it clearly combines physical, spiritual, and emotional cultivation in a way that makes sense to me and I enjoy practicing. Since then most of my studies have focused on this form of Qigong, which I’m now certified to teach. At the same time I continue to practice many of the forms I have studied over the years and have developed a deep appreciation for the diversity and depth of Qigong philosophy and practice. Through the teachings of Li Junfeng the lead teacher of the Sheng Zhen Qigong, I have developed a far reaching philosophical understanding of Qigong, centered around a definition of Qigong as the exchange of Qi between ourselves and the universe. Through out all of this time I have continued to study and practice yoga, dance and somatic education methods that also align breath, physical activity, and awareness. While these do not originate in Chinese culture or use the Chinese language to name themselves, they are part of the same field broadly defined. From one linguistic perspective Yoga could be called Indian Qigong, and somatic education could be called contemporary western Qigong. From another perspective Qigong could be called Chinese Yoga. It is important to recognize the differences in philosophy and methods of these different lineages, but at the same time it is very important not to loose sight of the commonalities. They are all bound to engage with the common ground of our humanness and our universe. They all engage with breath, movement and awareness and they all direct us inwardly to our direct experience of self and the universe.